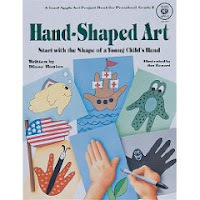 This is a cute craft I got from "Hand-Shaped Art," by Diane Bonica. 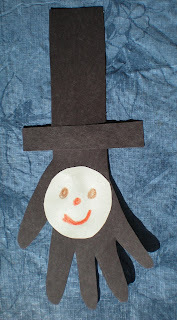 Have the children place their arm with an open hand on a vertical piece of construction paper. Trace their straight arm with the open hand at the bottom. If the children are able, have them cut it out. You will then need a face. Have them cut a circle out of white or flesh colored construction paper. Let them draw a face on the circle and glue it inside the open hand. Finally, take a small rectangle piece of black paper and glue it in place as the brim of the hat. I thought he turned out pretty good. these are such cute ideas. Thank you so much for sharing. Also, you have received the Noblesse Award on my blog. I know you may not post it, but wanted you to know you have it. I love all the great ideas you have on this blog.